The #1-rated Infant Car Seat in America! The KeyFit® 30 is engineered with innovative features that make it the easiest infant car seat to install simply, accurately, and securely, every time. KeyFit® 30 Zip Air also features stylish zipper accents, a quick-remove seat pad for machine washing, and a breathable 3D AirMesh backrest. Easiest to Install Correctly KeyFit® 30’s stay-in-car base has a ReclineSure® leveling foot and two RideRight® bubble level-indicators to help achieve and verify proper angle in the vehicle seat. The base is also equipped with premium LATCH connectors and a SuperCinch® tightener for a secure fit with a fraction of the effort! For alternate installation with the vehicle seat belt, clear belt routing and integrated lock-offs make it easy to position, tighten and lock the belt into place. Tailored for Comfort To accommodate newborns, the car seat carrier includes removable head and body support with reversible knit/mesh fabrics for all-season comfort. A five-point harness with one-pull tightening helps keep baby secure, and the carrier shell is lined with EPS energy-absorbing foam for improved impact protection. For comfortable shade from the sun, the zip-off canopy features a breathable mesh window and extra zip-on visor. A stylish zip-around boot creates a cozy environment. 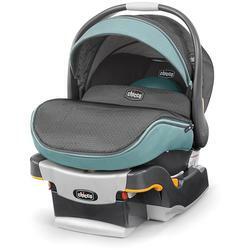 Built for Everyday Convenience The KeyFit® 30 is designed for travel system use with compatible strollers from Chicco. 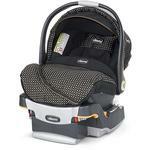 The carrier secures easily to the base and strollers with a reassuring audible click. A two-position carry-handle and one-hand release make it just as easy to remove.